Roger Pielke Jr.'s Blog: NOAA Explains the Global Temperature "Slowdown"
Observations indicate that global temperature rise has slowed in the last decade (Fig. 2.8a [ed.- above, caption below]). The least squares trend for January 1999 to December 2008 calculated from the HadCRUT3 dataset (Brohan et al. 2006) is +0.07±0.07°C decade–1—much less than the 0.18°C decade–1 recorded between 1979 and 2005 and the 0.2°C decade–1 expected in the next decade (IPCC; Solomon et al. 2007). This is despite a steady increase in radiative forcing as a result of human activities and has led some to question climate predictions of substantial twenty-first century warming (Lawson 2008; Carter 2008). El Niño–Southern Oscillation is a strong driver of interannual global mean temperature variations. ENSO and non-ENSO contributions can be separated by the method of Thompson et al. (2008) (Fig. 2.8a). The trend in the ENSO-related component for 1999–2008 is +0.08±0.07°C decade–1, fully accounting for the overall observed trend. The trend after removing ENSO (the "ENSO-adjusted" trend) is 0.00°±0.05°C decade–1, implying much greater disagreement with anticipated global temperature rise. Caption to Figure 2.8a: Monthly global mean temperature anomalies (with respect to 1961–90 climatology) since 1975, derived from the combined land and ocean temperature dataset HadCRUT3 (gray curve). 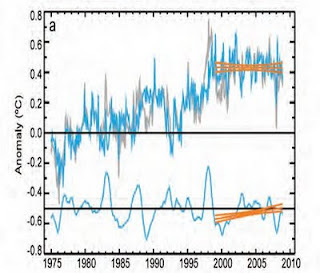 (top blue curve) The global mean after the effect of ENSO that has been subtracted is also shown, along with (bottom blue curve, offset by 0.5°C) the ENSO contribution itself. Least squares linear trends in the ENSO and ENSO-removed components for 1999–2008 and their two std dev uncertainties are shown in orange. Ensembles with different modifications to the physical parameters of the model (within known uncertainties) (Collins et al. 2006) are performed for several of the IPCC SRES emissions scenarios (Solomon et al. 2007). Ten of these simulations have a steady long-term rate of warming between 0.15° and 0.25ºC decade–1, close to the expected rate of 0.2ºC decade–1. ENSO-adjusted warming in the three surface temperature datasets over the last 2–25 yr continually lies within the 90% range of all similar-length ENSO-adjusted temperature changes in these simulations (Fig. 2.8b). Near-zero and even negative trends are common for intervals of a decade or less in the simulations, due to the model’s internal climate variability. The simulations rule out (at the 95% level) zero trends for intervals of 15 yr or more, suggesting that an observed absence of warming of this duration is needed to create a discrepancy with the expected present-day warming rate. The 10 model simulations (a total of 700 years of simulation) possess 17 nonoverlapping decades with trends in ENSO-adjusted global mean temperature within the uncertainty range of the observed 1999–2008 trend (−0.05° to 0.05°C decade–1). Lets see if I can sort this out probabilistically (readers please comment on the following math). In 10 x 70 years of simulation there are potentially 610 different decades (because you can't start a decade in the final 9 years of each simulation). If we subtract from the 610 the 170 decades that would begin as a member of the set of 17, as well as the 153 decades that would begin within the 9 years that precede each of the 17 decades (thus avoiding an overlap) that leaves a total of 287, allowing 278 potential decades. So 17 non-overlapping decades out of a set of 278 + 17 = 295 total decades is 5.8%. This is indeed larger than 5% but not by very much. It is safe to say, if my math is correct. of course, that even in the HadCM3 model simulations 10 years without warming is a rare event. These results show that climate models possess internal mechanisms of variability capable of reproducing the current slowdown in global temperature rise. 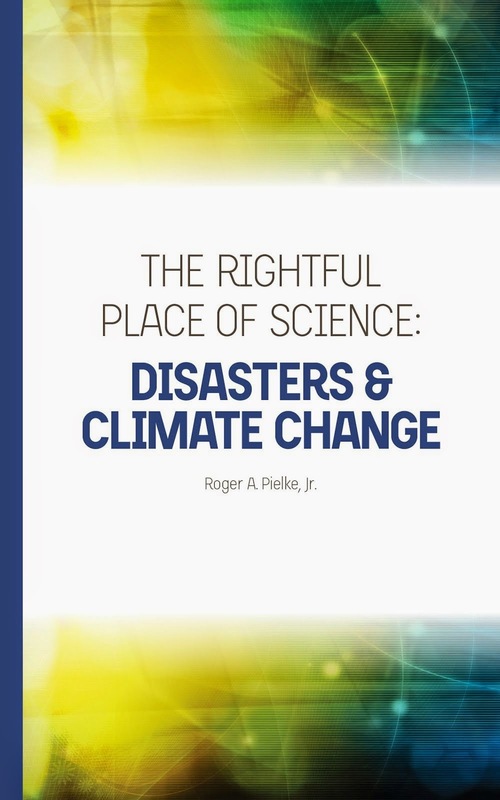 Other factors, such as data biases and the effect of the solar cycle (Haigh 2003), may also have contributed, although these results show that it is not essential to invoke these explanations. The simulations also produce an average increase of 2.0°C in twenty-first century global temperature, demonstrating that recent observational trends are not sufficient to discount predictions of substantial climate change and its significant and widespread impacts. Given the likelihood that internal variability contributed to the slowing of global temperature rise in the last decade, we expect that warming will resume in the next few years, consistent with predictions from near-term climate forecasts (Smith et al. 2007; Haines et al. 2009). Until the "slowdown" reverses you can expect that people will continue to talk about it. Kudos to NOAA for being among the first to explicitly state what sort of observation would be inconsistent with model predictions -- 15 years of no warming.